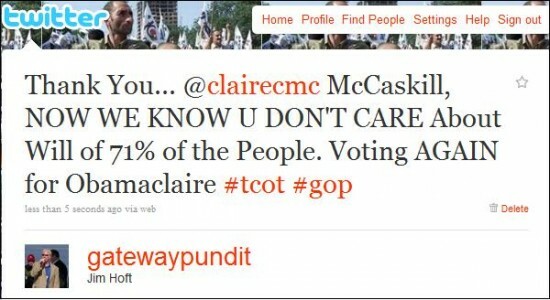 Even liberal Senator Claire McCaskill voted against repeal even though 71% of Missouri voters don’t want it. A Republican drive to repeal the year-old health care law ended in party-line defeat in the Senate on Wednesday, leaving the Supreme Court to render a final, unpredictable verdict on an issue steeped in political and constitutional controversy. The vote was 47-51. Moments earlier, the Senate agreed to make one relatively minor change in the law, voting to strip out a paperwork requirement for businesses. Republicans conceded in advance their attempt at total repeal would fall short, but they accomplished an objective of forcing rank and file Democrats to take a position on an issue that reverberated in the 2010 campaign and may play a role in 2012.